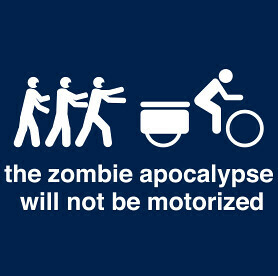 Home > Gear > The Zombies are Here! 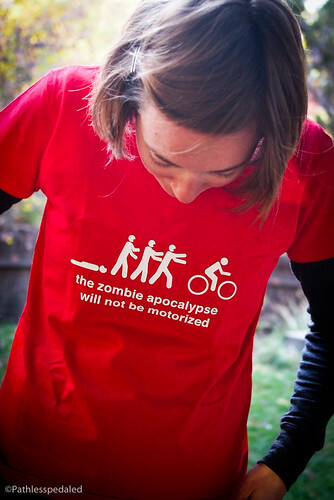 Ok, maybe not zombies, but our Zombie Apocalypse shirts have started shipping. We got ours the other day and have been really pleased with the print quality! The designs came out sharp and crisp. 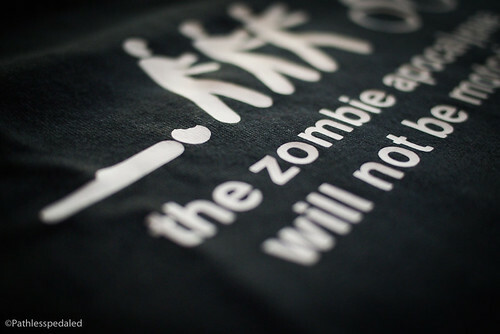 If you haven’t been on the site lately, you maybe wondering what all this zombie business is about. My friends and some readers know that I’m a big fan of zombies (even before The Walking Dead series, I might add). 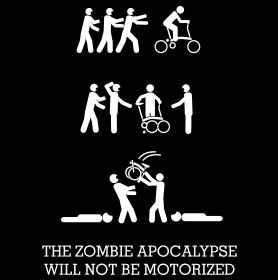 After a rather annoying ZipCar ad that poked fun at cycling, I poked back making a graphic with the copy that read “The Zombie Apocalypse Will Not Be Motorized”. 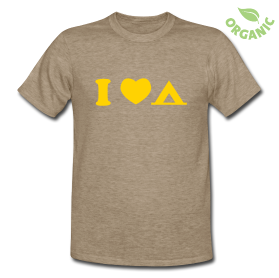 It was such a popular post on our Facebook page, that with the suggestions from some readers we designed the shirt. I loved the idea of playing with street sign iconography so have been modifying bike and pedestrian symbols to give it that understated transit nerd nod. It has been a big hit and the sales help us ever forward with our goal of getting to New Zealand this winter. So thank you everyone that has been buying the shirts and spreading the word! If you’ve received your shirt, send us a photo of you wearing it and you’ll be entered to receive some other PathLessPedaled goodies we’re creating. By popular demand, we’ve been making different cargo bike versions since we all know cargo bikes will rock the zombie apocalypse. 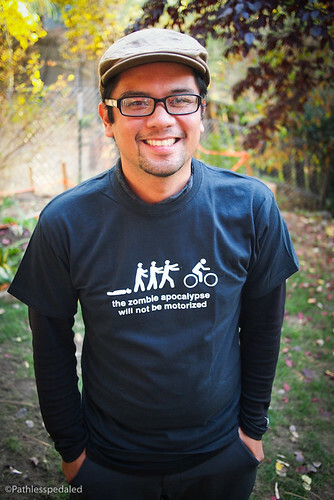 Check out the XtraZombie shirt. There’s also a bakfeits version. 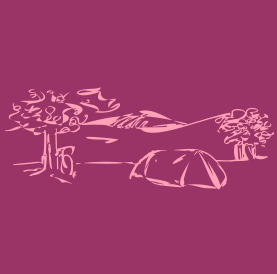 Of course, we had to do a special Brompton edition shirt with this logo on the back. We’ve also started expanding the shirts beyond just zombies to fun shirts about bicycling, bicycle culture and of course, bike touring. So check out our shirt storefront and pick up some new threads. Funds from the sales help us keep going! Thanks again for your support. We’re not independently wealthy and the nature of our lives and the path we’ve decided to take calls for some creative improvisation at times. We’re not following a set road map and are still feeling things out as we go along. 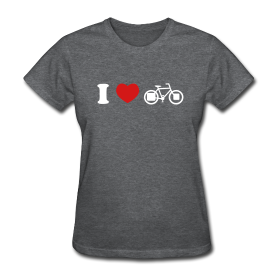 We never thought we’d do shirts, but they have been such a big hit and so much fun to make and design! 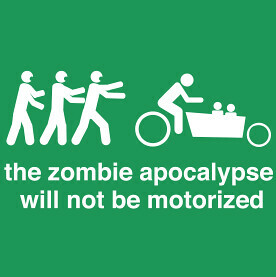 I love the zombie scratching his head while looking at the Brompton folding. Love it! Just got the message that mine has shipped — I can’t wait! Awesome. Thanks for ordering one Amanda! Just received the one I ordered for a friend. It’s awesome. Definitely ordering more for the holidays. 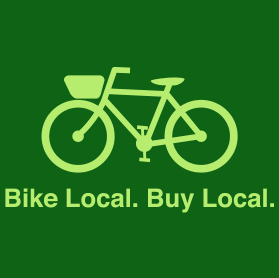 Hey, how about designing something to celebrate cycling and the Winter Solstice? Not sure what that might look like…. Hmmm, I’ll think on that. Thanks guys! !